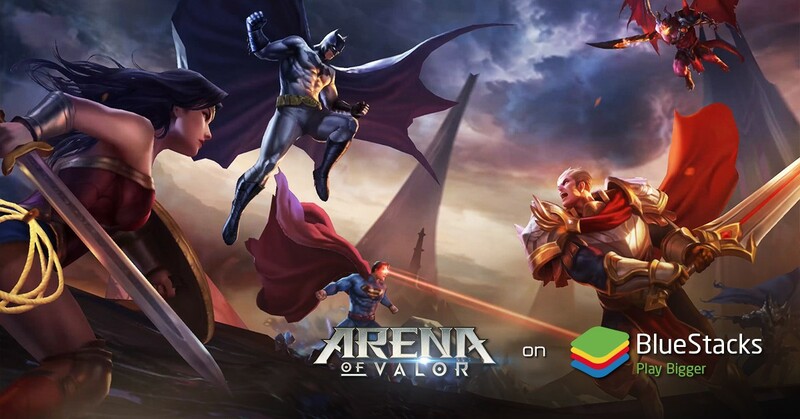 The warriors of Arena of Valor are a balanced mix between killers and tanks. This means they’re not much on either side but they can do both. So the idea is that as a warrior, you’d want to be able to get into a fight even when there’s a lack of a tank. At the same time, you want to be able to walk away from said fight with at least 1 kill. How about doing both and walking away with enough Hit Points (HP) to keep doing it?!! Of course, some warriors are put together a bit better than others!! Having a dual class helps but even some single class warriors can get the job done. As with any “Top X” list, you’ll almost always have someone that disagrees with it in some way. That’s fine and there’s nothing wrong with that. The point being, you can always try something else if you like. That’s fine and there’s nothing wrong with that too!! Next, depending on how you play and what you use, you very well could end up with different results. This guide is NOT an absolute and it never was. But it’s a pretty good start as a collection of warrior type heroes that won’t easily bomb out on you!! Unfortunately, warrior heroes don’t have much in the way of fun quotes!! That’s fine since you’re supposed to be busy killing things anyway!! This list is presented in no specific order. Now on with the warriors!! 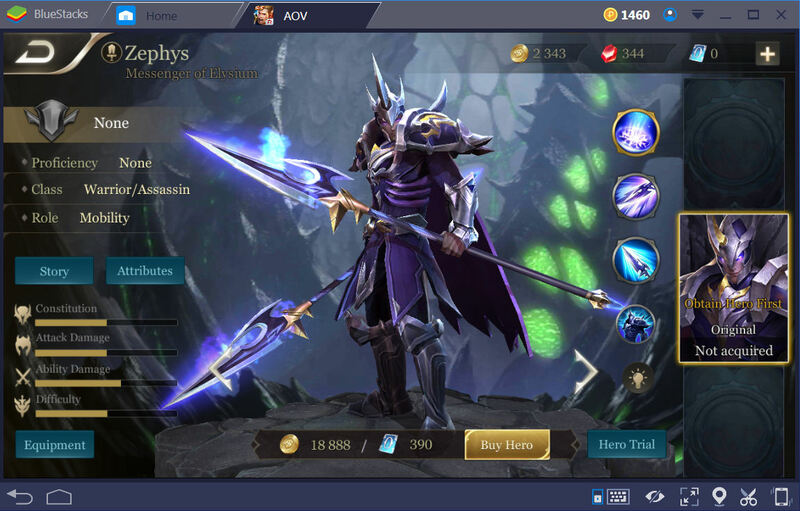 Zephys is listed as a dual class warrior. He has a pretty good survival rate with his passive and his Death’s Flurry skills. With a certain amount of HP lost, he takes less damage. The Death’s Flurry skill has a vamp effect as long as you hit a hero with it. Get hit a couple of times and then lead off your attack with Death Rift to get in close. Follow that with 1 or 2 basic attacks. Otherwise, just lead off your attack with Death Rift + 1 or 2 basic attacks. Use Death’s Flurry to regain some lost HP. Finish off an enemy hero with Death from Above. Your better bet is to either use that when your target has low HP or to close the gap again. Sonic Boots for the armor and damage reduction from normal attacks. The Beast for the attack damage which helps the vamp effect. Don’t just rely on Death’s Flurry for the vamp effect!! Mantle of Ra for the armor and extra damage to nearby enemies. Omni Arms for the extra damage, attack speed boost, vamp effect, and the cool down reduction (CD). Slikk’s Sting for the critical hit rate and critical hit damage boosts along with the attack speed boost. Shield of the Lost mostly for the attack speed reduction of enemies but the HP and armor boosts work nicely too!! 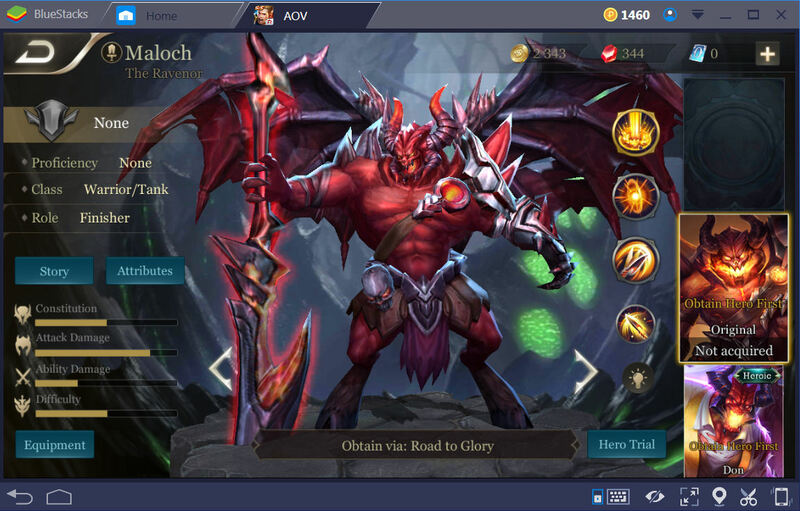 Maloch is listed as a dual class warrior. He can be a bit tricky to use but very tough to kill. His skills don’t do that much damage but they’ll help keep him alive and close enough to hammer targets with his basic attacks. The hard/tricky part is that you have to get in close to begin your attack. Start with Souleater and make sure you have many as you can targets inside the cone. Then use Cleave to hit as many heroes as you can. From there, basic attack as much as possible and use Shock on opponents that are trying to run away. Omni Arms for the extra damage, attack speed boost, vamp effect, and the CD Reduction. Spear of Longinus to gain CD Reduction, more armor, and to “nuke” a target’s armor with your basic attacks. The Beast for the attack damage which helps the vamp effect this item has. Ancestral Glory to help keep Maloch alive!! Even if he gets killed somehow, he’ll pop right back up in place with some HP to either continue fighting or “get out of dodge”!! Lu Bu is listed as a warrior. The idea with Lu Bu is to try to keep targets close by and slow. Even though the item build listed below doesn’t use it, you can change an item for Fafnir’s Talon for more attack speed to trigger his passive more. Red Stallion has a very short range but it can be cast 3 times in a row. So don’t rely on it too much to close the distance since it’s not always easy to aim it. Conqueror is mostly used to boost Lu Bu’s attacks and gain a set amount vamp effect (NOT a % based vamp effect). So, try to get in close to use Red Stallion 3 times. Pop your target(s) with Impale for a slow. Stick with basic attacks for a while to get Impale reset to use. Use Conqueror to either help keep you alive or for the damage boost. Mantle of Ra for the armor and extra damage to nearby enemies. Switch this with Fafnir’s Talon for more attack speed. The Beast for the attack damage which helps the vamp effect this item has. These items with Life Steal (vamp effect) stack with Conqueror. You should be seeing a lot more green numbers popping up next to Lu Bu when using him and these vamp items. Ancestral Glory to help keep Lu Bu alive!! 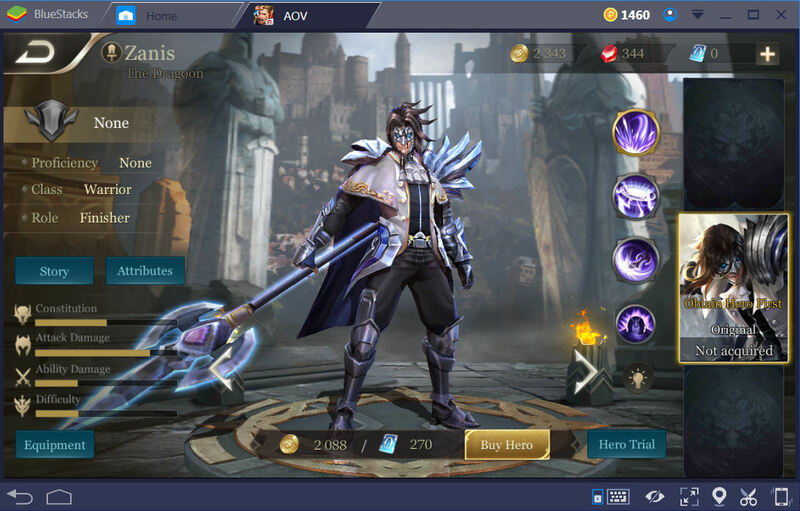 Zanis is listed as single class warrior. His passive relies on getting kills OR assists (up to 20) for a damage boost and to restore lost HP. Use Blood Wyrm + a basic attack to close the distance and do extra damage on a target. To make vamp effects from the item build really crank in, use Tail Sweep as soon as possible for its attack speed boost + basic attacks. Use Dragon’s Wrath as a finishing move and to help protect Zanis from other attacks with its damage reduction. Sonic Boots for the armor and damage reduction from normal attacks. You can swap these for the War Boots IF you want to boost his attack speed more. Blitz Blade mostly for the Chain Lightning. Honestly, who doesn’t like Chain Lightning?!! But the attack speed sure helps too!! Fafnir’s Talon to gain more attack speed boost and the vamp effect. Ancestral Glory to help keep Zanis alive!! 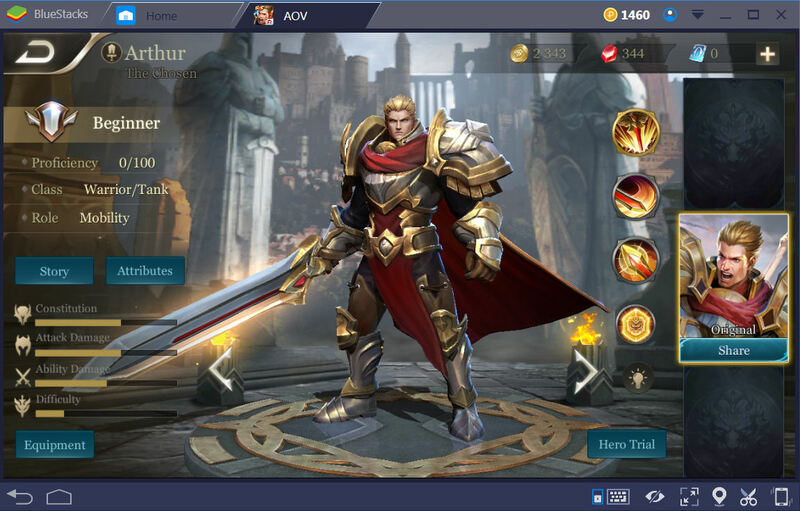 Arthur is listed as a warrior and a tank. So he can definitely shell out the damage and take a lot of hits too!! You’ll get more and more armor from his passive so that’s basically a wasted passive due to other effects. The fun part to Arthur is the ability to use his other skills while Holy Guard is in use. Lead off your attacks with Righteous Fervor + 1 basic attack while an enemy hero is targeted. You’ll be right on that hero in a heartbeat!! Next, activate Hold Guard and move around the area. Try to follow an enemy hero when this skill is in use. You can use Deep Impact (not the movie!!) on enemies that are trying to run away or as a finishing move. Just try not to jump into an enemy torrent’s attack range!! Gilded Greaves to help reduce some incoming damage. Especially from magic based attackers. Ancestral Glory to help keep Arthur alive!! 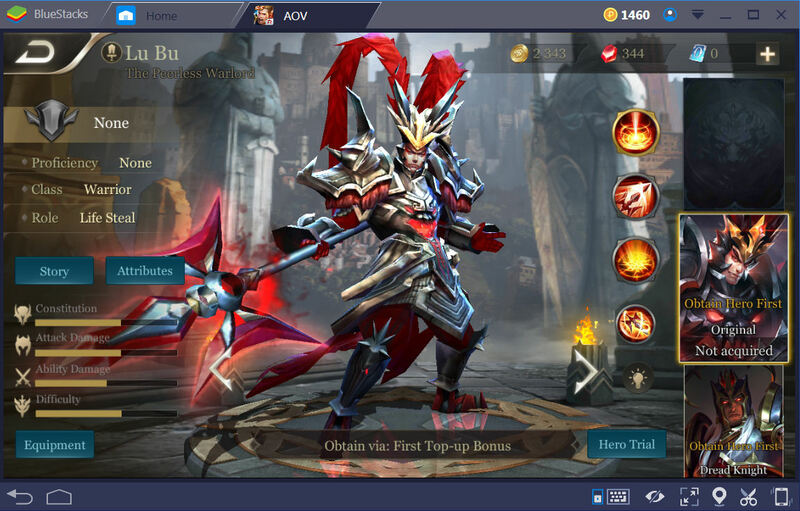 On a side note, Lu Bu is the only hero currently in Arena of Valor which can only be gained by using real money. He’s a reward for your first top up. Hope you enjoyed reading this guide and find the information here useful. 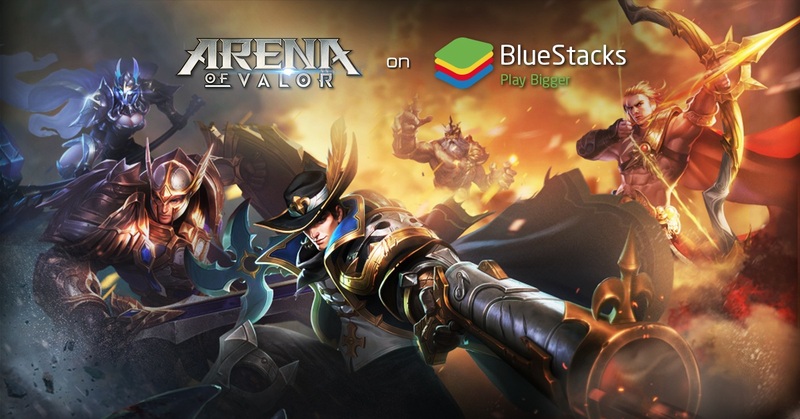 Have fun playing Arena of Valor on Bluestacks!